Spreadsheets that are used in the real world are full of errors and cause companies and organizations to lose millions of dollars every year. Finding and correcting spreadsheet errors is a very difficult and time-consuming activity. Observing that all errors in spreadsheets result from updates or changes applied to the spreadsheet - be it during the creation of a new spreadsheet or while adapting an existing one - an obvious alternative to debugging is to prevent errors by making these update operations safe. We have created an extension to Excel, called Gencel, that is based on the concept of a spreadsheet template, which captures the essential structure of a spreadsheet and all of its future evolutions. Such a template ensures that the spreadsheet can be changed only in the the anticipated ways, so that spreadsheets evolving from templates will provably never contain any reference, range, or type errors. Gencel can help to reduce maintenance costs while at the same time it dramatically increases the level of correctness and reliability of spreadsheets. 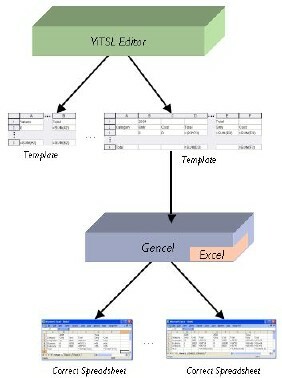 The basic idea behind the Gencel system1 for creating correct spreadsheets is to anticipate the possible evolutions of a spreadsheet and capture a class of spreadsheets in a template. A program generator will then create an initial spreadsheet together with customized update operations for such a template. These customized update operations allow users to edit the created spreadsheet while ensuring that no reference, range, or type errors can be introduced into the spreadsheet. Templates are created with an editor, called ViTSL, which is similar to Excel, but offers additional functionality to specify templates. These templates can then be loaded into the Gencel system, which is implemented as an extension to Excel, and allows the safe, error-free editing of spreadsheets. The relationship between these two components and templates and spreadsheets is summarized in the following figure. The best and fastest way to get an impression of how the approach works is to read the first two sections (about 6 pages) of the ViTSL paper and watch the following short movie that demonstrates the working of the system.